Broadleaf Commerce is a B2B and B2C solution for modern businesses. It gives you flexible E-Commerce features that allow you to establish and promote your brand in the online market. Whether you have multiple business sites or stores, the all in one solution from Broadleaf Commerce can help you address most of the issues that arise normally. It’s scalable as well, so it can fit the needs of business of any size and industry. Broadleaf Commerce has been serving fortune 1000, fortune 500 and many of the top 500 companies in the world. That says a lot about the reliability and efficiency of this software. You can now assist your customers with their online shopping. Broadleaf allows you to guide your customers through and helps them find the right product. This cart management tool can incredibly reduce your cart abandonment rates by providing simpler ways to manage orders and checkouts. Broadleaf’s account management tool helps you to assist you to customize and provide your customers with personalized shopping experience. It doesn’t require customer contact details and registration. It also helps you to market your future products without much of a hassle. Whether its multiple stores, brands, sites or vendors, the all in one interface from Broadleaf Commerce keeps everything in one place. With just one click, you can enter into a different store and checkout the progress. You can create as many product options as you like. Assign values such as type, size, color, text and much more. This is particularly useful for larger stores which run several departments within. Customer notifications regarding order tracking are also featured in this software. Your sales representative can view order history to make sure that the items are delivered on time. This helps you maintain your service quality and check which areas need improvement.The product management tool lets you schedule product deployments, manage price lists and check inventory status in real time. You can monitor stock levels to ensure you never run out of any items. Also, since it looks at the marketing aspect of your products, it can be considered as a complete marketing and merchandising solution for businesses. If you are considering Broadleaf Commerce it could also be a good idea to check out other subcategories of Best eCommerce Software listed in our base of SaaS software reviews. Every business is different, and might need a particular type of eCommerce Software solution that will be adjusted to their business size, type of customers and staff and even particular industry they cater to. You should not count on getting a perfect app that is going to be suitable for every business regardless of their background is. It may be a good idea to read a few Broadleaf Commerce reviews first and even then you should remember what the service is intended to do for your business and your employees. Do you need a simple and intuitive solution with only elementary functions? Will you really make use of the advanced tools required by pros and big enterprises? Are there any specific tools that are especially beneficial for the industry you operate in? If you ask yourself these questions it will be much easier to get a trustworthy software that will match your budget. How Much Does Broadleaf Commerce Cost? Broadleaf’s SMB and enterprise pricing information is available only upon request. Contact the company for more details, and ask for your quote. We realize that when you make a decision to buy eCommerce Software it’s important not only to see how experts evaluate it in their reviews, but also to find out if the real people and companies that buy it are actually satisfied with the product. That’s why we’ve created our behavior-based Customer Satisfaction Algorithm™ that gathers customer reviews, comments and Broadleaf Commerce reviews across a wide range of social media sites. The data is then presented in an easy to digest form showing how many people had positive and negative experience with Broadleaf Commerce. With that information at hand you should be equipped to make an informed buying decision that you won’t regret. What are Broadleaf Commerce pricing details? 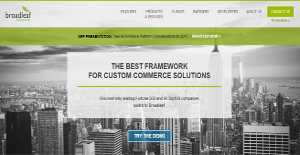 What integrations are available for Broadleaf Commerce? Broadleaf Commerce is an open source platform. It means that it uses an open API to be scaled to any size and can be integrated with any system.